Time is money. So when you find a product that saves you a ton of time, even though it might cost a little extra, you know it is still worth it. 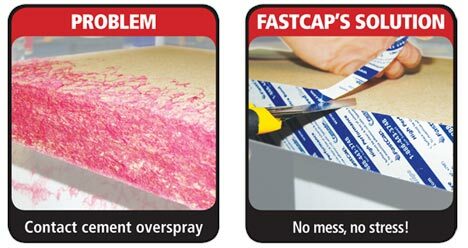 The SpeedTape from FastCap is one of these great money saving products. SpeedTape is a double-sided tape that is specifically designed for quick and easy veneering and laminating. I first used SpeedTape on a large paneling job at a new church project here in SoCal. Most of the panels were cut to size at the shop, but the ones that required a custom fit also required some veneering to cover the raw edge. There are problems that arise when trying to apply edge banding onto a panel that is pre-finished. In the past we would use spray glue because it is faster then liquid contact cement, but this means we would have to tape up the panel and hope we didn't get any glue on the finish. Often, if the temperature was too hot or too cold, we would discovery that the glue would not even hold. In short, it was a pain. When we discovered SpeedTape, it was like a dream come true. Not only is it really fast to install, but the holding strength is amazing. I am a SpeedTape fan. SpeedTape comes in 1”, 1.5” 2” and 6.5” sizes in 50' rolls. You can even get custom sizes made in widths up to 54”, though I don't know how economical these would be VS contact cement. Prices start at $10 for 1”x50'.